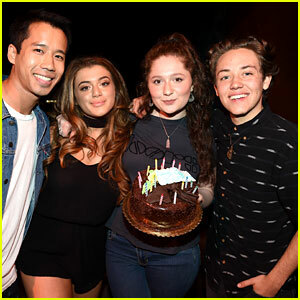 Ethan Cutkosky poses with his Shameless co-star Emma Kenney, his girlfriend Brielle Barbusca, and JustJared.com‘s Jared Eng at the Just Jared Jr. presents the Disney Mix Launch Party on Friday (August 19) at The Greenhouse at Platform in Culver City, Calif.
Other young stars in attendance at the party included Brielle‘s brother Thomas Barbusca, Nicky, Ricky, Dicky & Dawn‘s Lizzy Greene, Bella and the Bulldogs‘ Brec Bassinger, School of Rock‘s Ricardo Hurtado and Jade Pettyjohn, 100 Things to Do Before High School‘s Jaheem Toombs, Shameless‘ Morgan Lily, siblings Gabriel and Talitha Bateman, Scorpion‘s Riley B. Smith, Lethal Weapon‘s Chandler Kinney, Gortimer Gibbons‘ Ashley Boettcher, Fresh Off the Boat‘s Albert Tsai, Powerpuff Girls‘ Kristen Li, The Amazing World of Gumball‘s Terrell Ransom Jr., and Project MC²‘s Ysa Penarejo. Nikki Hahn, Max Gecowets, and Jet Jurgensmeyer huddle around the tablet while playing the new app at the Just Jared Jr. presents the Disney Mix Launch Party on Friday (August 19) at The Greenhouse at Platform in Culver City, Calif. The cast of Adventures of Babysitting joined a bunch of different celebs to check out Disney Mix, which is a social messaging/chat app where you can chat, share, and play with friends for free. Cast member Madison Horcher was also at the party with older sister Madalyn. Also in attendance at the event were Paris Berelc, Ryan and Raymond Ochoa, Natalie and Alyvia Alyn Lind, Asia Monet Ray, Isabella Acres, and Emily Hahn. 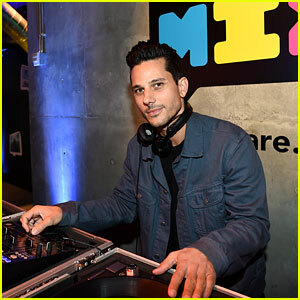 Bobby French spins tunes for the guests at the Just Jared Jr. presents the Disney Mix Launch Party on Friday (August 19) at The Greenhouse at Platform in Culver City, Calif. The DJ was playing all the latest and greatest hits that had the kids dancing all night long. Some of the stars in attendance at the party included the casts of Disney’s Stuck in the Middle – Jenna Ortega, Nicolas Bechtel, Isaak Presley, Kayla Maisonet, Ariana Greenblatt, Ronni Hawk, and Malachi Barton – and the upcoming series Andi Mack – Peyton Elizabeth Lee, Joshua Rush, and Asher Angel. Ronni was seen hanging out with actor Gavin Casalegno, his sister Ashlyn Casalegno, and actress Jaden Roberts. Disney Mix is a social messaging app where friends can chat, share, and play in a whole new way! You can also get the latest BTS photos and videos from favorite TV shows, movies, and music artists by adding Radio Disney, Disney Channel, and Disney Movies to your friends list – you’ll get notifications directly from them when new stuff is available. Download the app now! Olivia Holt hits the stage for a performance at Just Jared Jr. presents the Disney Mix Launch Party on Friday (August 19) at The Greenhouse at Platform in Culver City, Calif. The 19-year-old singer performed four songs for the crowd, including her single “Phoenix.” Watch a clip below! Also in attendance at the event were fellow singers New District, Ryan Beatty, Steffan Argus, Jordyn Jones, Ellise and Cailee Rae (with boyfriend Jack Dytrych), as well as social influencer Aidan Alexander, Fresh Off the Boat‘s Luna Blaise, and Teen Vogue photographer Bella Newman. FYI: Olivia is wearing a Related Apparel top and Aldo shoes.